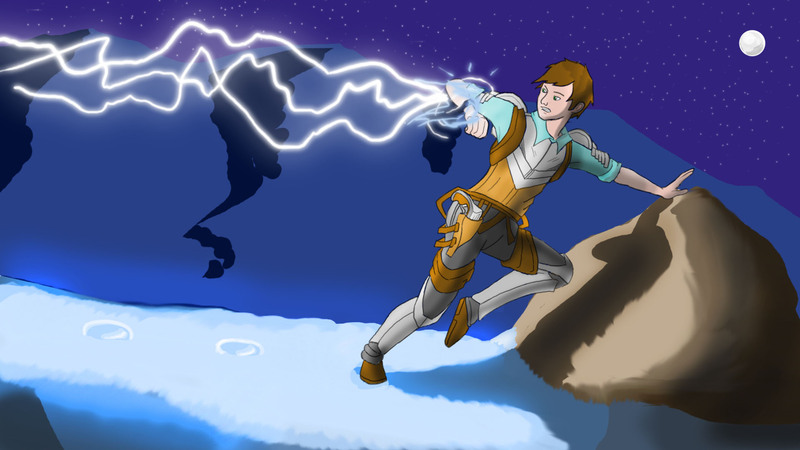 A burst of electricity arced through the sky so fast, the light flashed past Orwan’s eyes, blinding him momentarily, striking a nearby boulder with incredible force. The stone cracked and shattered in an instant, sending sharp shards of rock into the sky. The energy nullifier on his wrist lit up immediately, sensing the sharp tang of ozone in the air. And though the snowfall hadn’t been extreme this high in altitude above the Falstadt Valley, Orwan’s steel-plate boots heaved through it towards the mountain descent. Every searchlight of the guard post trained upon him. So much for stealth. Only seconds before another peal of lightning came for him, and he doubted the soldiers atop the battlements would miss a second time. He scrambled into loose brambles, diving headfirst behind a collection of thin trees. Just for fun, he ripped his pistol from its holster and fired wildly into the great wall behind him. The leaden incendiary bullets inside popped small pockets of flame against the stonework of the high walls, but made little effect beyond that. With a high-pitched squeal and an angry pop, lightning spewed forth from atop the wall directly down upon Orwan’s position. Most of the arms of lightning struck harmlessly against the ground. But enough sprayed down from above that Orwan decided he would rather his heart keep beating. He spun on his heels and raised his forearm against the burst just as the lightning collided with him. The nullifier went into action with a whirl. Instead of electrocution, Orwan felt a burst of force, but he held firm against it. The power at his wrist fizzled and swirled like water in a siphon, charging the compact capacitor within. In a flash, the lightning vanished, and Orwan fell backwards. Not for long – Orwan knew when he wasn’t wanted. He jumped to his feet and pushed forwards through the loose branches. The branches soon ended. Suddenly without resistance, Orwan rolled forwards and planted headlong into the snow, his pistol landing a few feet away. Orwan caught sight of the nullifier’s light-green screen: twenty-seven percent. A single burst of lightning for a fourth of a battery. The shouts and cries of the soldiers up top grew into a dull roar. They were going to find him out in the open. He leaped to his feet and sprinted forwards down the mountain, grabbing and holstering his pistol. A few seconds passed. The familiar high-pitched noise of the energy turret cried out behind him. Orwan spun, raised his forearm again and shut his eyes. This time the lightning collided with an angry explosion against the nullifier. A direct hit. The speed of the energy absorption threw Orwan’s arm backwards, sending him flying even faster down the mountain. He immediately lost his footing, flying head-first into the rocks and snow. Times like these make a man grateful for plate armor, though regretful that that suit of plate armor didn’t include arm or elbow guards. Call it prideful fashion. Either way, the sharp rocks sliced their way through Orwan’s arms. He ignored the immediate pain. Further down the hill, the boulders became larger – the only place to hide from that blasted turret. “Come on, come on,” Orwan breathed, checking the nullifier as best he could in a dead downhill sprint. The display had cracked. It dimly read eighty-two percent. No way it would completely absorb another direct hit. This was no time to play lightning rod. Three seconds. He could hear the whine start up again. Better use the armor while he had it. Orwan planted his feet firmly, and jumped into the air towards the closest cover. Not soon enough. The lightning rocketed across the mountain slope and glanced off the nullifier in mid-air. It gave a pathetic beep, and Orwan felt his heart skip a beat. Then with a crash, Orwan finally connected with the ground behind the large boulders. Surprise crossed his face when his legs didn’t snap in half. He slid across the ground on his plate shin guards, collecting rocks and dirt until coming to a stop. It was then he saw the blood. His arms were covered in streaks of red. He collapsed behind a rock, and looked at the nullifier. Orwan disconnected the wire and stowed it and the crystal back in his belt. Vyse would know exactly where he was now. Well, both the good guy and the bad guys would. The distance between the fort and his position fell further and further away, and thanks to the rocks and cliffs between, there was no way the lightning turret would have a chance. The hounds, on the other hand… He could already hear the barking. He descended the rocky slope as fast as he could, checking his pistol. The pale moonlight didn’t help much. Three more shots. Four? Hopefully he didn’t need any. He could see the vertical cliff down beneath him, maybe a three-hundred foot drop between the snowline and the valley foothills below. He clicked on the crystal communicator on his belt. A small beep. A beep that could mean a three-hundred foot fall that ended with a splat or one that ended up in good hands. Time to find out. Orwan slowed and stopped to catch his breath, just before the drop-off. If Vyse needed to adjust his position to catch him, it might take a few moments. The warhound sprinted and howled like mad. He drew his pistol and fired. The shot collided with the dogs maw in a bright burst of flame. At first, Orwan didn’t think it slowed the animal at all. It didn’t. The animal squealed in pain and tripped over itself. Orwan dove to the side; the mastiff rolled sideways right off the cliff. A brutal practice run, he thought to himself. He looked down – the communicator was still bright blue. You know, if this is the end, Orwan thought to himself. It’s not the worst way to go. A long fall and a short stop. But man, would Vyse be disappointed. Who else would put up with his nonsense? Orwan took a few steps backwards, took a breath, and sprinted forwards. He let himself close his eyes, at least for the first few seconds of the descent. Everything was weightless, mind-numbing weightless. Then he felt the cold wind on his face and arms and everything fell to darkness except for the bright moon in the sky. No pain. No bright light at the end of a tunnel. No, just warmth from underneath and breathing above. “Don’t… just shhh,” Orwan said. “Fair enough. That’s enough excitement for one day,” Vyse said, taking Orwan in one hand. The giant turned and started his trek back towards the forests of the Falstadt Valley with his friend in tow. Hooray for Wacom! I have no idea how to color, but there ya go. Still fun! Feel free to click to see the bigger version.